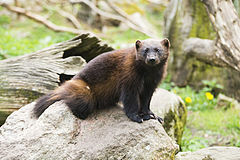 The wolverine or glutton (Gulo gulo) is the largest member of the Mustelidae family (the weasels). It is a stocky and muscular carnivore, more like a small bear than other mustelids. The wolverine, a solitary animal, has a reputation for ferocity, and can kill prey many times larger than itself. It is a powerful and versatile predator and scavenger. There is a clear difference between two subspecies: the Old World form Gulo gulo gulo and the New World form G. g. luscus. The male is about 18 in (46 cm) tall, the female 14 in (36 cm). Their length ranges from 36 in (91 cm) (female) to 45 in (110 cm) (male) and they reach a weight of around 25–36 lb (11–16 kg). Their tail measures about 8 in (20 cm). Their brown fur protects them from the extremely cold temperatures and their big feet enable them to walk on top of snow. Wolverines live primarily in isolated arctic and alpine regions of northern Canada, Alaska, Siberia, and Scandinavia. they are also native to European Russia, the Baltic countries, northeast China and Mongolia. In 2008 and 2009, wolverines were sighted as far south as the Sierra Nevada, near Lake Tahoe, for the first time since 1922. They are also found in low numbers in the Rocky Mountains and northern Cascades of the United States, and have been sighted as far south and east as Michigan. 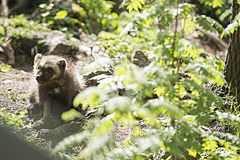 However, most New World wolverines live in Canada. Wolverines feed on almost every type of food that they can find: mice, rats, birds, bird eggs, reindeer and other large prey. Wolverines prefer to hunt larger prey in winter, when the snow slows down the prey and gives the wolverine an advantage. Wolverines are highly territorial. Wolverines reproduce every two or three years. The female gives birth to one to three young (called kits) in a tunnel called a den deep underneath snowdrifts. Humans are the wolverine’s main enemy. The wolverine’s thick, warm fur is used to manufacture the trim of a parka's hood or other winter clothes, as the dense guard hairs do not collect frost. In February 2013, the United States Fish and Wildlife Service proposed giving Endangered Species Act protections to the wolverine largely because climate change (global warming) is whittling away its wintry habitat in the northern Rockies. Wikispecies has information on: Gulo gulo. Wikimedia Commons has media related to Gulo gulo. ↑ 1.0 1.1 Abramov A; Belant J. & Wozencraft C. (2009). "Gulo gulo". IUCN Red List of Threatened Species. Version 2009.2. International Union for Conservation of Nature. Retrieved 2010-01-25. ↑ Knudson, Tom (5 April 2008). "Sighting prompts California to expand search for elusive wolverine". Sacramento Bee. Archived from the original on 30 July 2013. ↑ Griffith, Martin (22 March 2009). "A year later, wolverine spotted again in Sierra". San Francisco Chronicle. ↑ Runk, David. (2004-02-25) First Michigan wolverine spotted in 200 years – Technology & science – Science – msnbc.com. MSNBC. Retrieved on 2011-09-16. ↑ "Wolverines". Montana Department of Fish, Wildlife and Parks. fwp.mt.gov. This page was last changed on 19 September 2018, at 13:56.